This is a screenshot from the game Mass Effect 2. The game was a revelation for me because it reminded me of something I knew, but forgot along the way. See the blue and red bars? The blue bars are paragon points, for being good in the game. The red bars are renegade points, for being bad in the game. In most games, there is one bar showing the total of good and bad (completely hiding bad actions if there were more good actions). No one is perfect, everyone makes mistakes and most mistakes should not follow someone forever. In Mass Effect 2, they make it very clear which actions are good and which ones are bad. The player makes the choice to do bad. 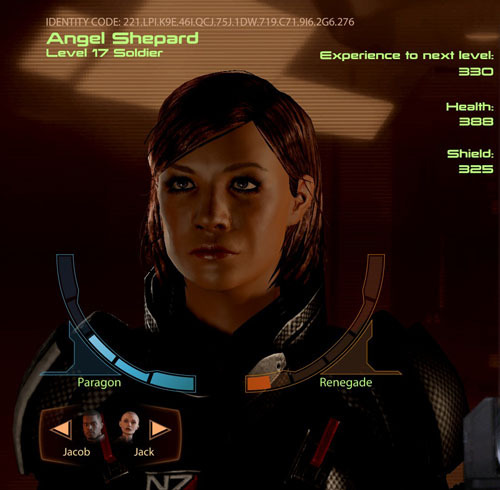 When I started playing Mass Effect, I didn’t like two bars. I wanted my paragon bar to be maxed with no renegade because I wanted a “good” character (note her name – Angel). As I played the game, there were situations where I wanted to do the renegade action. For example, a bartender tried to poison my character. Going back and confronting the bartender was clearly marked as a renegade action (which I did). It became clear I had to make a choice: either play the game making decisions I did not like to have full paragon points or I played the game that would be most fun (or made the most sense) to me and have renegade points. You can see what I did. Real life is the same way. No matter how good someone tries to be, they’ll end up doing something “bad”. I consider myself “good” but I still do “bad” things, depending on the situation. If someone steps to me wrong, I am not going to be a “good little girl” and take it because I believe people treat you the way you allow them to treat you. The truth: most people know when they are doing a renegade action and they have an idea, if found out, how “bad” the outcome would be. When people talk negatively online about their jobs, they have a pretty good idea that there would be a price to pay if the co-workers they were talking about read what they said. It’s cowardly, to go online and vent instead of speaking up. However, people do it every day and people get fired for it every day. Why? People foolishly believe they will not get caught. This does not change the action of saying something behind someone’s back being a renegade action. The goodest of the good do bad things. Do you go over the speed limit? Never tell a lie? Pay all of your bills on time? Always keep your word? Ever go over budget or over spend? There are renegade actions littered within good actions. The good actions do not make up or take away the renegade (bad) ones. The goal is simple, right? A person should have more paragon (good) actions than renegade (bad) actions. There is one problem: doing good does not equate to wiping away the bad. You cannot change your story, you cannot re-write history, you cannot change your past. Many people do something good to receive the benefit of clouding the bad action. For example, an employee might seem to be hard working but that is only because the worker is trying to cover the lie told that the project was further along than normal. Or a cheating spouse might get a gift for their mate to ease their guilt. The key to recovering from a mistake is doing good; expecting nothing in return. Doing something for the benefit of receiving something in return is not a good action; it’s a manipulative act to get your way. This is why many people fail to recover from big mistakes; their intent was not sincere. They end up reverting to the old behaviors because nothing changed, outside of getting caught. Going back to Daniel’s situation, to recover he’d first have to sincerely apologize. Most people did not accept the statement as being sorry for what he did. However, the apology should happen when he has changed and it would bother him not to apologize, not to get in anyone’s good graces. He would also return any items he might have received in exchanged for writing the articles, especially since those articles were deleted. Keeping the merchandise (if he received any) would bother him if he sincerely changed. Eventually, doing “good” things for the right reasons (if he sincerely changes), people will leave the past in the past. The motivations behind the good actions are pure and non-selfish. When trust is broken it takes time. There is no rushing the healing process and no guarantee the trust can be rebuilt. The best option is to not take the renegade actions unless you’re sure you can live with the outcome. Edit: Daniel did an interview. Note how he talks as if he still works at TechCrunch in the beginning. Note he dodges with the details with what happened with the solicitation of items in exchange for articles. Personally, I think Daniel should have kept his mouth shut. So much for Andrew helping to build the kid up. Let me be clear on this: Andrew keeps asking Daniel what happened with his “exclusive” interview. Doing this interview proves Daniel is too wet behind the ears to be in tech. It pains me to watch this video. On the real.